Rockland is about a four-hour drive from Boston, an hour and a half drive northeast from the Portland Jetport, an hour and a half drive south from the Bangor Airport, and just five minutes from the Knox County Regional Airport in Owls Head, which has regular fights from Boston on Cape Air. Flying to Portland and renting a car or taking the bus is likely to be the most cost-effective option for visitors coming from New York, Washington, D.C., and points south. Whether you fly into Portland, Boston, or Bangor there are several ways to get to Rockland. There are numerous national car rental locations in Portland and Bangor. There is regular bus service from the Portland and Boston airports to Rockland on Concord Coach Lines, and the bus stops right at the Maine State Ferry Terminal, from which you can catch the ferry to North Haven. The Amtrak Downeaster runs from Boston to Portland and then take the bus up the coast to Rockland. North Haven is located 12 miles offshore in the heart of Penobscot Bay. It is reached by ferry from the small city of Rockland, Maine. The 70-minute ferry leaves Rockland for North Haven at 9:30am, 2:20pm (Please note the new time!) or 5:15pm daily; it returns to Rockland from the island at 7:30am, 12:30pm, and 3:45pm. The ferry is the main mode of transportation for year-round residents and visitors alike. If you are interested in other ways to get to the island, please see Other Options. This may sound a bit silly, but one of the most important things to do when you arrive at the Ferry Terminal in Rockland is to make sure you are boarding the correct ferry! Ferries to Vinalhaven and Matinicus islands also leave from this terminal, and it can be confusing. Check with the ferry staff to be sure you are getting on the right ferry and, if you are bringing your car—see below for instructions and tips—make sure that you are parked in the correct line. For information on ferry tickets and rates, car reservations, bringing a bike and more, please call the North Haven Ferry Office at (207) 596-5400, or visit the Maine State Ferry Service website. The island is big enough that having a car to explore can be well worth the effort, but during the busy summer months of July and August, doing so does require extra effort and planning. The ferry can carry a maximum of 17 cars (there is always space for passengers and ususally for bikes), so on some busy summer days you might have to wait through one or two boats to get your car on. The best approach at this time of year is to make a reservation for your car (they accept 4 per trip), which can be done up to one month in advance. However, after Labor Day, it is both easy and advisable to bring a car to the island. Please call or email us for more advice about bringing a car to the island–we’re happy to help! If you do find yourself with a few hours to kill before getting on the ferry, there is plenty to do in Rockland within walking distance of the Ferry Terminal. The busy Main Street is just up the hill from the Ferry Terminal, where you’ll find lots of great restaurants, small shops, art galleries, and the Farnsworth Art Museum, nationally known for its collection of paintings by the Wyeth family and other well-known Maine artists. If you don’t need to leave your car in line, the mile-long walk out to the Rockland Breakwater Lighthouse is just a 5-minute drive from the ferry. If you are leaving your car in Rockland, we recommend that you park in the State Ferry parking lot or in Knight’s Marine lot, located just adjacent to the Ferry Terminal. Both charge $10 per day (as of February 2016). Nebo Lodge is located right in town, less than five minutes' walk up a small hill from the ferry. If you would like a ride for any reason, please let us know in advance and we will be happy to meet you at the ferry with a vehicle. Once at the inn, we have bikes for rent to help you explore the island. If you want a quick or adventurous way to reach the island of North Haven, or you miss the ferry, there are some other ways to get here. There are options to help you get here for an few nights of vacation at Nebo or just for dinner. Private passenger boats can also bring you to the island. They are more expensive than the ferry, but for a larger group or an evening trip to the island for dinner we highly recommend these captains to get you to North Haven in their lobster and passenger boats. All three of these boat captains also offer day trips to help you and your family explore beautiful Penobscot Bay. 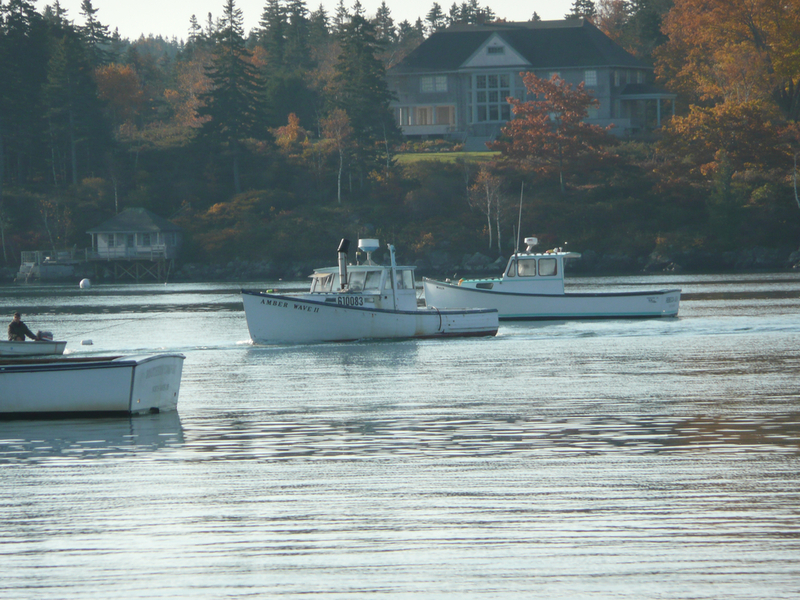 Foy will take you out in his lobster boat to haul a few traps and then enjoy a lobster bake on a one of the beautiful uninhabited islands that surround North Haven. And John or Pete is happy to transport you to Camden, Stonington, Isle Au Haut, or wherever you need to get in the bay.